TEAL (Tokyo Electronic Application Laboratory Ltd.) was a major Japanese calculator manufacturer that produced many models, often labelled for other companies. 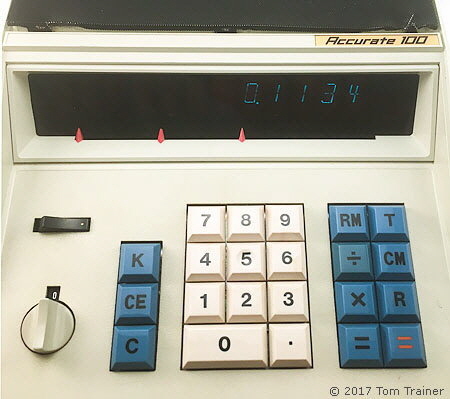 Here the TEAL TL-2M is shown together with the same model labelled for the Accurate Calculator Corp. as the Accurate 100. Display is 12 digits, "Nixie" type tubes. The six main integrated circuits are by Mitsubishi. 226 x 290 x 90 mm. (8.9 x 11.4 x 3.5"). Made in Japan, by Tokyo Electronic Application Laboratory Ltd. 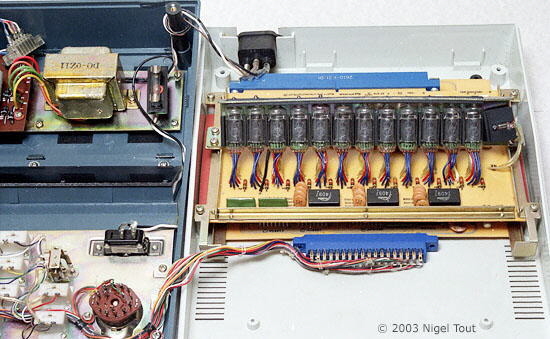 Significance: This calculator requires a six chip chipset to perform the calculator functions. 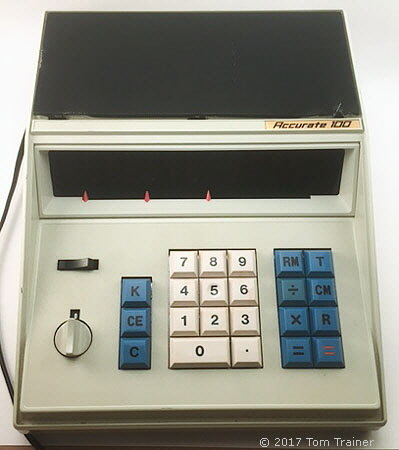 TEAL (Tokyo Electronic Application Laboratory Ltd.) was a major Japanese calculator manufacturer that produced many models, especially hand-held, for other companies. 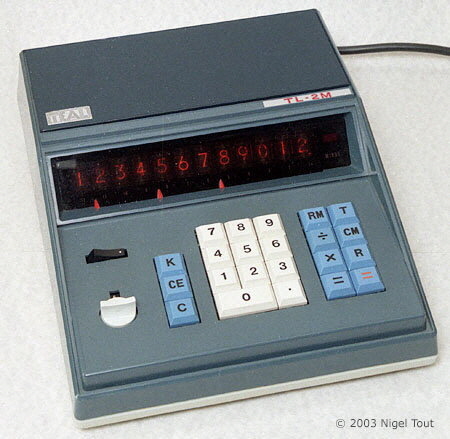 It was also a pioneer of the solar-powered calculator with the TEAL Photon. However, it was one of the casualties of the crash in the prices of calculators in the mid-1970s which caused it to go out of business in 1978. 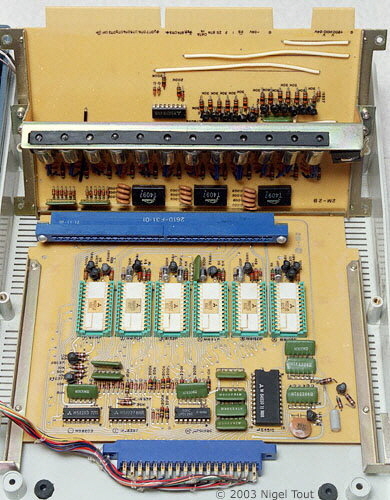 With the cover removed, showing the display board with the 12 "Nixie" type tubes. The logic board is mounted below it. The logic circuit board showing the six integrated circuits by Mitsubishi in ceramic packages. OEM version of a calculator similar to the TEAL TL-2M labelled for sale by Accurate Calculator Corp. as the Accurate 100. Close up showing that although the keyboard is the same as the TEAL TL-2M this version uses blue-green Vacuum Fluorescent Display (VFD) tubes instead of the amber "Nixie"-type tubes. The VFD tubes were a later development and were cheaper to manufacture than the "Nixie"-type tubes. The label on the rear of the Accurate 100 indicates its manufacture by Tokyo Electronic Application Ltd. It is highly unusual for such a relationship to be spelled out like this on the calculator. Often the only clue to this relationship is that the design of a calculator labelled for a marketing company, that did not manufacture, is identical to that of a known manufacturer. A very similar looking Accurate 200, using blue-green VFD tubes, is also known. Information about Accurate Calculator Corp. is very sparse but it appears to have been formed in New York in 1971. If you have more information about the company please get in touch.